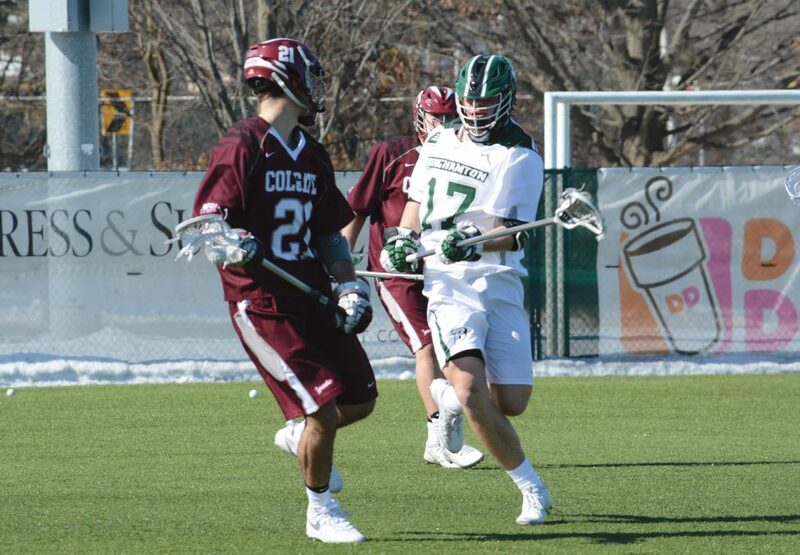 Jonathan Flores/Pipe Dream Photographer Redshirt senior attack Sean Gilroy scored a team-high six goals in the Bearcats’ win over Hartford on Saturday. The Binghamton men’s lacrosse team has certainly been challenged this season after an impressive 11-5 record during the 2017 season. BU (4-8, 1-2 America East) had already amassed eight losses and was sitting at 1-8 heading into its matchup with Siena on March 27. Since then, the Bearcats have earned three straight victories, including their most recent victory against the Hawks. The conference matchup began with redshirt senior attack Sean Gilroy scoring his first of six goals less than 30 seconds into the game on an assist from sophomore midfielder Jon Perotto. The Hawks (3-7, 0-3 AE) scored the next three, but Gilroy responded with two more to tie it up before the conclusion of the first quarter. The Hawks struck first in the second quarter, but the Bearcats dominated for the rest of the period. Five goals from four different players paved the way, and senior attack Thomas McAndrew buried his second goal of the quarter with just five seconds on the clock. Hartford junior attack Dylan Jinks started off the second half with two scores to pull within two, but Binghamton answered once again. Perotto and senior midfielder Stephen Petrelli both converted on man-up and Gilroy netted his fifth of the day to go up 11-6. Hartford continued to push back, sprinkling in four more goals late, but the Bearcats were too much. Gilroy and McAndrew struck again in the fourth to bring their totals to six and three, respectively, closing out the Hawks on the road. Binghamton executed a clean game and came away with the victory in part because of the mistakes the team didn’t make. BU turned the ball over only 10 times in comparison to the Hawks’ 15 and the Bearcats were a perfect 22 for 22 on clears, avoiding any wasted possessions. Six different players capitalized on the day for BU as it overcame a rough early start to end its road trip victorious before heading back home. Three more conference matchups will cap off the season, starting with UMBC at home. The Retrievers are near the bottom of the conference at 3-7 but are coming off a stunning upset over No. 1 Albany. After traveling to Pennsylvania and Connecticut for their last two outings, the Bearcats will return home for senior night. Fittingly, the seniors have played a huge role in Binghamton’s recent success. BU’s top three scorers, Gilroy, McAndrew and Petrelli, are all in their final season as Bearcats. “It’s always nice to play at home. We’ve been leaning on our seniors, such as [Gilroy] and McAndrew, and I don’t think Saturday will be any different,” McKeown said. Binghamton is set to face UMBC on Saturday. Opening faceoff is scheduled for 7 p.m. from the Bearcats Sports Complex in Vestal, New York.